First, the prevalence of the King James Version surprises me, since in general I’d expect biblical scholars to cite more modern translations in their work. However, it turns out that when scholars outside the field of biblical studies cite the Bible (generally for just a single quote), they’ll often use the KJV. 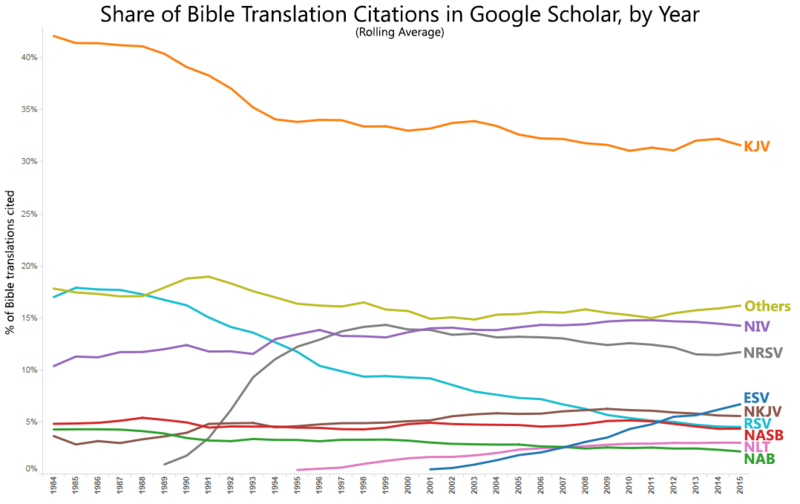 Since Google Scholar doesn’t limit results to only religious scholarship, the KJV comes out on top. Second, scholars prefer the NRSV and RSV more than the wider Christian audience does: the NRSV has held a roughly 12% share of scholarly citations since its introduction but is responsible for under 2% of Bible translation searches on Google. The RSV (and even the KJV) declined in scholarly share shortly after the release of the NRSV in 1989. Third, the only translations to gain substantial scholarly share over the past thirty years are the NIV, the NRSV, and the ESV; the latter two are revisions of the RSV. This methodology has several major limitations; therefore, you shouldn’t read too much into the exact numbers but should instead focus on broader patterns. Overall, however, the percentages largely match my expectations. The first limitation is that the queries are imperfect: “ESV,” for example, can serve as the abbreviation for any number of phrases (e.g., “end-systolic volume”). While I tried to pick queries that appeared to yield relatively few false positives, they’re definitely still there. I couldn’t combine queries (e.g., [niv bible or “new international version”]), so the absolute numbers shouldn’t be taken too literally. Second, Google Scholar’s definition of “scholarly” work is fairly loose; some of the fluctuations in certain translations may be the result of Google changing its scope over time. You are currently browsing the OpenBible.info Blog blog archives for November, 2015.